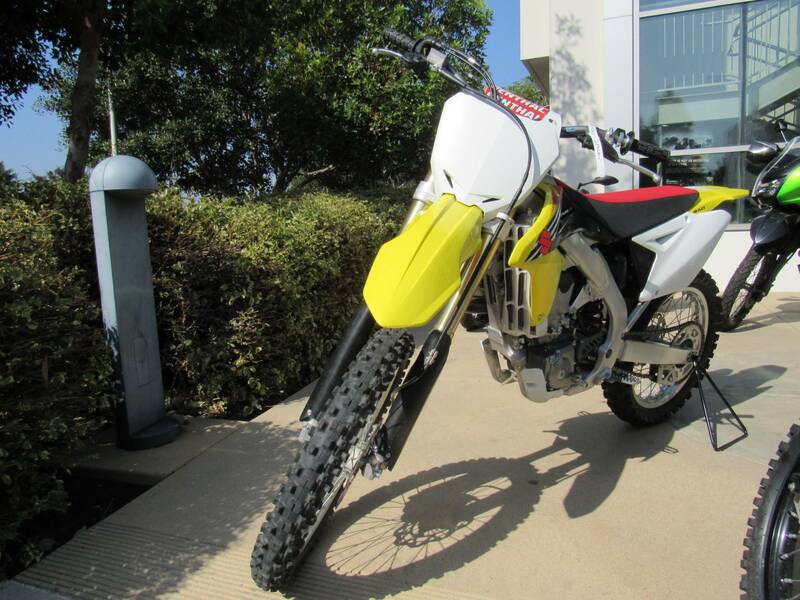 The 2012 RM-Z450 is an open-class motocross machine that's ready to dominate the toughest of tracks. As a racer, you need quick, laser-accurate steering and confidence-inspiring high-speed handling all in one package. And you want a high performance machine with a racing pedigree that makes it competitive right out of the crate. The RM-Z450 has been taking champions across the finish line ahead of the pack for years, fiercely competing across the globe from the World MX1 series to America's prestigious AMA Supercross and outdoor motocross championships. It’s no secret that champions choose Suzuki! The RM-Z450's slim chassis design makes for a comfortable riding position, opening up the cockpit to help allow the rider to actively take control of the machine. Class-leading 47 mm Showa inverted forks provide optimum wheel travel and are compression- and rebound-damping adjustable. A Showa piggyback-reservoir rear shock with high / low-speed compression damping adjustment and rebound damping and spring preload adjustments. The rear shock, working through Suzuki's superlative rising-rate linkage system, provides 310 mm of wheel travel, delivering maximum traction. The RM-Z450's twin-spar aluminum frame and swingarm was developed and refined for a highly optimized balance between rigidity and superb high-speed traction. The lightweight swingarm helps enhance terrain-traversing performance over bumps. Race-inspired disc rotors offer enhanced cooling performance and efficient mud slinging. 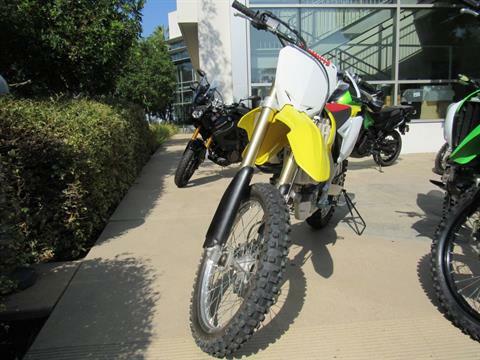 A stylish two-tone radiator shrouds accentuate the RM-Z450's agile looks. The RM-Z450 comes with a gripper seat, with projected cross-shaped patterns on the top surface to provide additional grip. 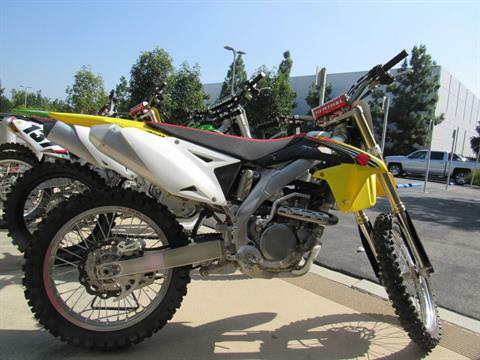 The RM-Z450's 449 cc four-stroke, liquid-cooled, DOHC, four-valve, fuel-injected engine was developed and refined to deliver phenomenal idle-to-redline thrust. 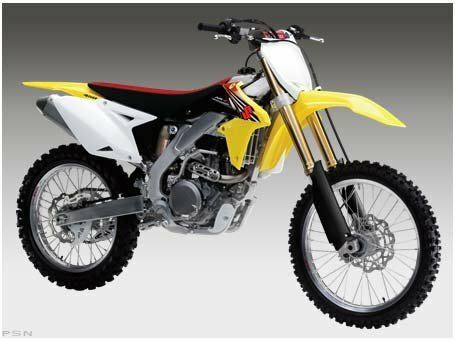 The lightweight, battery-less, motocross-use electronic fuel injection system uses progressive throttle linkage for efficient power delivery. A 12-hole fuel injector delivers a fine fuel / air mist for efficient operation. The RM-Z450's aluminum cylinder is treated with Suzuki Composite Electrochemical Material (SCEM) coating, and was built for durability, light weight and efficient heat transfer. The RM-Z450 meets a stricter AMA noise limit (94 decibel) while keeping smooth engine output. Suzuki's class-leading fuel-injection system uses technology derived from Suzuki's championship-winning models. 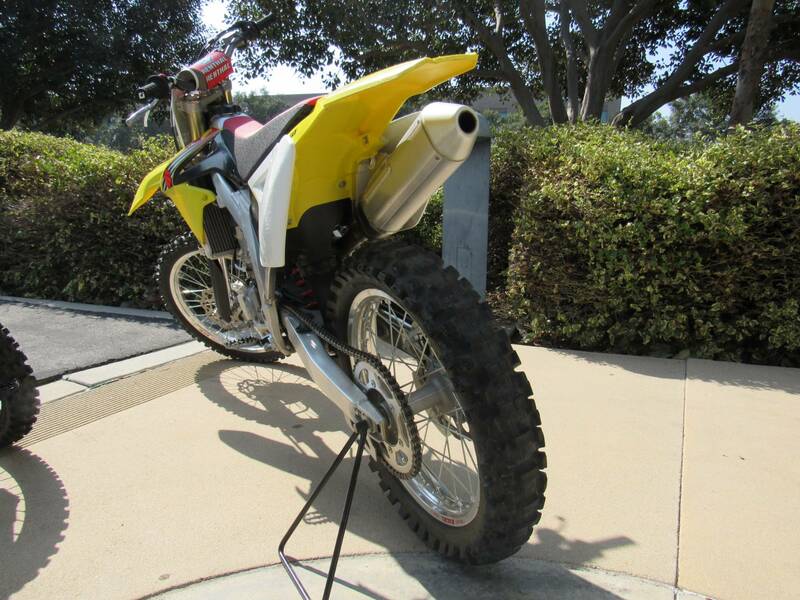 The RM-Z450, the first motocross bike to ever use fuel injection, has won both outdoor championships as well as a Supercross championship. A five-speed transmission provides extra flexibility, offering gear ratios suited for various terrains and conditions. The RM-Z450 has a link-type shifting system, which offers smooth transitions through the gears.